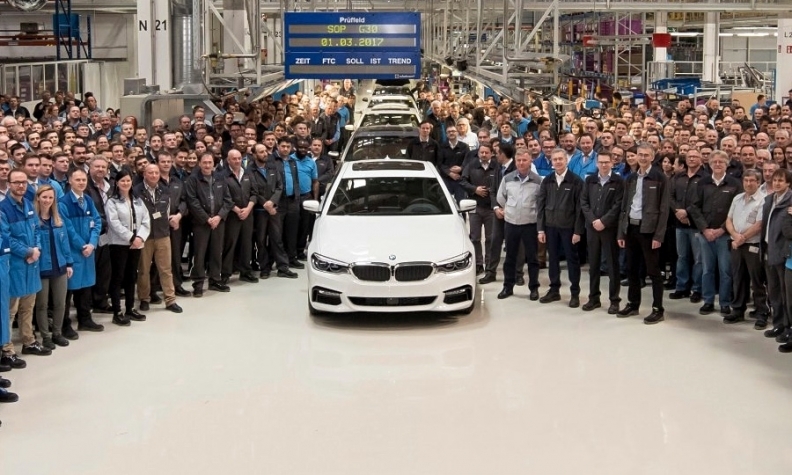 Magna International tweeted this photo of the first BMW 5 Series rolling off its assembly line in Graz, Austria, on March 2. Magna International started building the BMW 5 Series on March 2 in Graz, Austria, kicking off an aggressive expansion of the Canadian parts giant’s auto-assembly business. The 5 series will be followed by two Jaguar models as well as two unspecified vehicles, Magna CEO Don Walker said on a Feb. 24 conference call. By 2019, Magna expects annual assembly sales to be between US $6.6 billion and US $7.1 billion, compared with US $2.2 billion last year, Walker said then. Magna has built vehicles for BMW in the past. That includes the BMW X3 in 2003, followed by the MINI Countryman in 2010 and the MINI Paceman in 2012. JLR signed a contract in July 2015 for Magna to build vehicles at Graz. Going into production early next year will be the Jaguar I-Pace battery electric vehicle. Production plans for another JLR model are expected to be announced late this year. Magna is the world’s largest contract manufacturer of vehicles. The company also ranks No. 3 on the Automotive News list of the top 100 global suppliers, with worldwide sales of original equipment parts of $32.1 billion in 2015.